Every lenten season Christ is always the center of everyone's worship. It takes them a week to revere Him, to recollect His sacrifices from womb to tomb. We should understand not only spiritually but practically to take Christ upon ourselves for it's a life-and-afterlife duty and responsibility not only for a moment, for an hour, for a day, for a year but for time and eternity. Let's come unto Him for his yoke is easy and his burden is light. Let's humble ourselves for those who humble themselves as little child, the same is greatest in the kingdom of heaven. Let's reconcile and be at peace with those who trespass against us for God will forgive us as we who forgive others. Let's invoke always the spirit to be with us for it's the spirit of Christ, our conscience that always tells us the proper way of what to do. Let's serve Him with all of our might, mind and strength by serving and converting others to the gospel of Jesus Christ, the doctrine of salvation. Let's face the truth and live it for the truth shall make us free. We couldn't forget it. It's CHRIST. Isn't it? I know it is in CHRIST that we are saved for no one comes to his father except by him. He is the way, the truth and the life. He is extending us the invitation to come unto Him. His atoning sacrifice entitles us to be saved after all we can do. He was crucified for our sins and to fulfill all righteousness. Soon He will come sitting at the right hand of His Father to judge us. By doing our share in learning of Him, of following His examples, and of exemplifying Christ-like attitude, we are ready and prepared to face Him at the judgment seat for the end of the world is nigh at hand. Sally DeFord has arranged and composed "Come Unto Christ" song. Click the following video to view and listen to it. For the accompanying lyrics, you may download the song and copy the lyrics from the link mentioned above. Lent remind us to remember the things we have done and we haven't done. A time to repent and a time to be grateful for all the sacrifices our Good Lord made for us. I do hope that this will not end just for this week but we can always remember God goodness everyday of our life. I admire bloggers who find time to blog about Christ, most specially this Lent. God bless you bro, and may you be blessed more so you can also bless others more. Thank you for reminding us once more of the need to repent and to heed his call. people knows a lot, they just need to be reminded of things. thanks. Yahweh bless. Every year, we are being reminded of the sacrifices of JESUS. Every year, we repent and reflect. Every second of our lives should be centered to only one GOD. We're working on our salvation and to work on it is a life-long process for we're not perfect. Thanks for the post Gil. I love the song a lot, very inspiring. 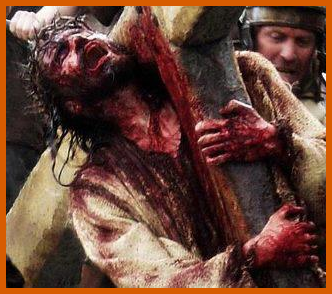 And although, I am not used to seeing a gory picture of Jesus Church as in the one above, I know that indeed He had suffered to atone for our sins, and that He bleed from every pore. His atoning sacrifice allow us to be resurrected and to attain eternal life if we will repent! Sorry for the mutilated picture of Jesus Christ, not Church. I know it's inadvertently written as such. You're absolutely correct when we'll repent of ours sins, we might attain eternal life. I hope reflecting on the goodness of Jesus would not end on Easter Sunday. I hope it will continue throughout the year. thanks for this wonderful post. A reminder and reflection that Christians ought to remember, always.